11/17/2017 You divide the damage as you cast Electrolyze, not as it resolves. Each target must be assigned at least 1 damage. 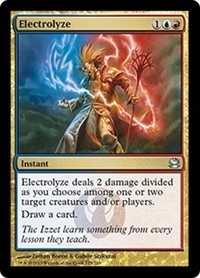 In other words, as you cast Electrolyze, you choose whether to have it deal 2 damage to a single target, or deal 1 damage to each of two targets. 11/17/2017 If Electrolyze targets two creatures and one becomes an illegal target, the remaining target is dealt 1 damage, not 2. You’ll still draw a card. 11/17/2017 If all chosen targets are illegal as Electrolyze tries to resolve, it won’t resolve and none of its effects will happen. No damage will be dealt and you won’t draw a card.